The Sony Ericsson Xperia X2? 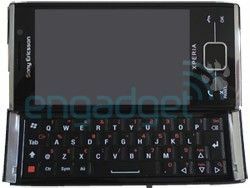 Sony Ericsson might have been busy wowing the world with its flagship Satio handset, but new pics have leaked out of the next in the Xperia line, the X2. According to a user on mobile-review forums, the new phone will be packing some serious grunt under the hood as well as Windows Mobile 6.5. However, some of the specifications seem a little bit high end for what is ostensibly a business phone, which means you should probably take them with a pinch of salt. An 8.1MP camera, a 3.5-inch OLED screen, a 'faster processor', 512MB of RAM and a rehash of the panels interface that characterised the original X1, including one with remote play for the PS3 as well. It seems more like a wish list for what the next Xperia could be like, rather than what it will have, although the rate at which phones are picking up 8MP cameras and OLED screens, coupled with the fact this won't be out for a while if it's waiting for Windows Mobile 6.5, mean that it could very well be true. What is beyond dispute is the fact that Sony Ericsson needs to keep knocking out winning handsets, and if it could deliver this in Q4 of this year then it would likely qualify as such.